Christmas joy, by the bundle. It’s easy to get caught up in the chaos of consumerism during the Christmas season. 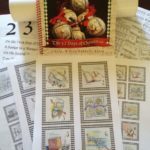 This year, get off the manic Madison Avenue merry-go-round with author Rebecca Even’s book, Our Father Gave to Us The 12 Days of Christmas: A Story For All Christians, accompanied by her 12 Days of Christmas Ornament Kit and 12 Days of Christmas song. The book, kit, and song work together to bring you peace and joy during the real 12 days of Christmas—December 25 to January 6—by helping you reflect upon the true spiritual meaning hidden behind the words of the popular Christmas song. Celebrate the real 12 Days of Christmas. 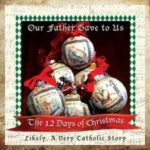 Discover Our Father Gave to Us The 12 Days of Christmas: A Story For All Christians. It’s easy to get caught up in the chaos of consumerism during the Christmas season. This year, get off the manic Madison Avenue merry-go-round. Author Rebecca Even will help you reclaim your peace with her book, Our Father Gave to Us The 12 Days of Christmas: A Story For All Christians. The charming illustrated book, a retelling of the popular 12 Days of Christmas song, is based upon historical research revealing the true spiritual meaning hidden behind its words. Letters were discovered written by two Jesuit priests in the 17th century discussing the song as a way to secretly teach children the faith during a time of heavy persecution. For example, the partridge in a pear tree is really the Savior in a manger. Two turtledoves are really the two testaments, and so on. The book also points out that the true 12 Days of Christmas begin on December 25 and culminate on January 6—the celebration of the epiphany. Author Even encourages you to take time each day to remember and reflect on God’s gifts, creating spiritual transformation and tranquility in a time that’s typically fraught with chaos and turbulence. Great for school and parish fundraisers. Lively and inspirational presentation great for women’s conferences , homeshcoolers and mom’s groups.